Coco: Movie Clip - Anything to Declare? Which movie is right for you this weekend? Coco? Darkest Hour? The Man Who Invited Christmas? Fandango's Nikki Novak shares a slice of 'za with the cast and creators of Disney's Coco. Colorful and full of music! You gotta see it. Anthony Gonzalez from 'Coco' was born to play the voice of Miguel. Looking for movie tickets? 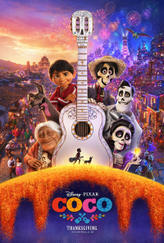 Enter your location to see which movie theaters are playing Coco (2017) near you.